Take a close look at this hand signal. What do we see? Not one but THREE 6 symbols. 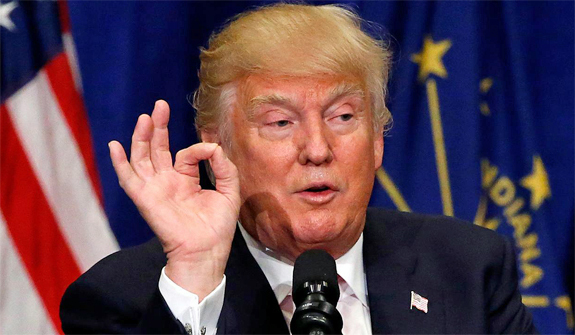 Recently it occurred to me, after watching our president Donald Trump speak, that he continued to use the hand signal of the number 666. As we reviewed other speeches from president Trump, this signal is an habitual one. We know from the above Word of God that the beast man, the man who will head the USA at the time of the Sunday Law, will be known by the number 666. Let us look more into the identifying mark–666. Last year we posted on how Barrack Obama was a leading choice of the 666 man. While he is still not eliminated as a candidate, it behooves us to study this issue afresh. As the scroll unrolls we should revisit this subject. First, the Scriptures point out that as the number of the Beast, it is talking about the Two-horned Beast(TWB), not the Leopard like Beast(LLB) (Rev. 13:1-10). And as it says it’s also the number of a man, we can only see that it describes the head of the Beast system, a ruling leader of the USA. Many Adventists have held to the belief that the Pope is the 666 man, based on several factors, the primary one being his official title “Vicarius Filii Dei” depicts the numerical number –666. The following facts are evidence that the Pope can not be the 666 man. Whenever the Bible speaks about the LLB it mentions the wound (Rev. 13:3, 12, 14) And the beast described in connection with the 666 man (Rev. 13:11-18) makes no mention of the wound. The 666 number has been held as very important in the history of paganism and spirituality. When we know the context of God’s word, as above, and know the common use of 666 in paganism/spiritualism in our world’s history, we can securely eliminate the false idea of the Pope being the 666 man. Although, admittedly it has taken a life all its own upon the retold yarns from our church leaders down to this very day! Satan chuckling all the way to his hell hole bank. As the Papacy, according to the Spirit of Prophecy, has “had her day”, we cannot expect the 666 man/beast to rise to the center stage of power if it’s the Pope. “Here is wisdom. Let him that hath understanding count the number of the beast: for it is the number of a man; and his number is Six hundred threescore and six.” Rev. 13:11-18. The power that is represented by this two-horn beast will identify itself with “the false prophet,” for together they are “cast alive into a lake of fire.” Rev. 19:20. From this it is plain to see that the wonders which the beast does in the sight of men, and by which he deceives them “that dwell on the earth” (Rev. 13:13, 14), are wrought by the false prophet (Rev. 19:20) “in the sight of the beast.” Rev. 13:14. Clearly, then, the beast’s civil authority, combined with the prophet’s supernatural power, points to a union of beast and prophet — an affiliation of state and of church representatives. Having only two horns, not ten, the beast therefore depicts a local, not a universal, government. Nevertheless, he will influence all Christendom to “make an image to the beast, which had the wound by a sword, and did live”; that is, he will engineer a world-wide governmental setup, re-enthroning the principles of the church-state rule of Ecclesiastical Rome. Being the restorer of these principles, he, along with the prophet, will become the world’s chief dictator, and shape not only the political and the religious policies of the governments, but also the world’s commerce. He shall decree “that no man might buy or sell, save he that had the mark, or the name of the beast, or the number of his name.” Rev. 13:17. This beast represents a man who stands at the head of a nation, and whose influence goes far and wide among the kings of the earth. He is further identified by a number — the mystical number “six hundred threescore and six.” Rev. 13:18. The prevailing belief that the number “666” is the numerical identification of some other power, is the spawn of the Prince of Darkness, and is calculated to conceal if possible the identification of this two-horn power. Inspiration puts the number on the two-horn beast, and there we must leave it. When the number is finally made up, the servants of God will be able to convince all the “wise” as to just whom the beast symbolizes. We now see, though, that no one who studies the Word of God, need be deceived when this power does appear on the stage of action. Yet notwithstanding God’s warning against giving allegiance to the beast, the world fails to give heed, with the result that even after his number is made up, “he causeth all, both small and great, rich and poor, free and bond, to receive a mark in their right hand, or in their foreheads.” Rev. 13 :16. “There are many beasts spoken of in the Bible, but this two-horned beast is the only one that can be termed “a man.” It will be noticed that from the 11th verse on, of the 13th chapter of Revelation the Scripture speaks of the two-horned beast and closes with the words: “For it is the number of a man; and his number is six hundred three-score and six.” Therefore, the mystical number “666,” belongs to the two-horned beast and none other. However, we may not conclude that no one before it could have such a number. The idea that the papacy is called the beast is altogether wrong. The papacy is represented by symbols on two different beasts. First, on the “non-descript” of Daniel 7, by the “little horn having eyes like the eyes of a man, and a mouth speaking great things;” second, on the “leopard-like” of Revelation 13, by the head that was “wounded to death.” These beasts are universal, representing the entire world in their time, both civil and religious. Therefore, it could not be said of either beast, “it is… a man.” The papacy being only a part of both beasts (horn-head on one, and simply a wounded head on the other) cannot be called “the beast.” The two-horned beast is the only one representing a local religio-political government. The “False Prophet” joins up with the 666 man for their final deceptive works upon the earth. The 666 man unites church and state for the great one world religious system–Mark of the Beast. The leader of the USA nation will be that 666 man. We are heading into some historic and supernatural times. We know that our leader of the USA shall be a prime player in these last days. 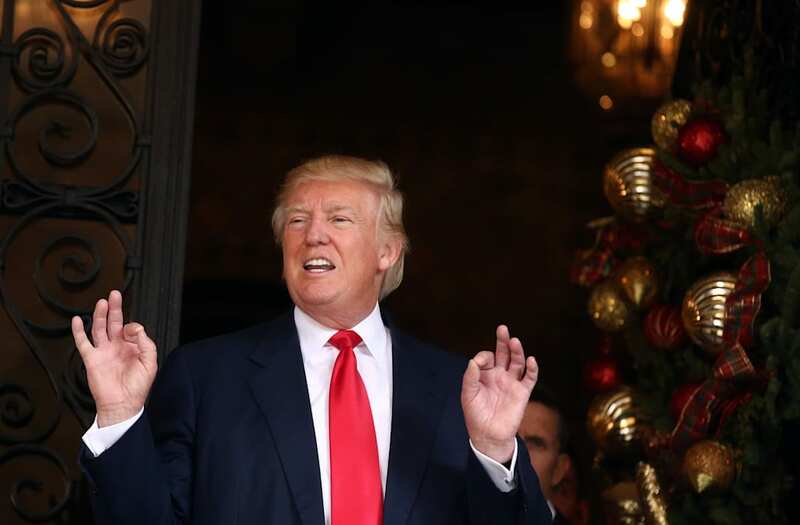 As events now unfold the baton is now held by Donald Trump. We cannot know, until it actually begins to develop, whether his hand signals showing the number 666 are what the Lord looked upon in defining the 666 man’s identity. As Inspiration says , it’s not “as clear as we should like to have it”, but let’s keep an eye on unfolding events. This entry was posted on October 28, 2017 at 5:21 am and is filed under Revelation teachings. You can follow any responses to this entry through the RSS 2.0 feed. You can leave a response, or trackback from your own site. Wow very interesting, amen brother rob.